With Spring Break time of the year approaching, I’m posting this amazing postcard from what I believe to be Bal-Week(spring break) in the early 1920’s on the Balboa Peninsula. 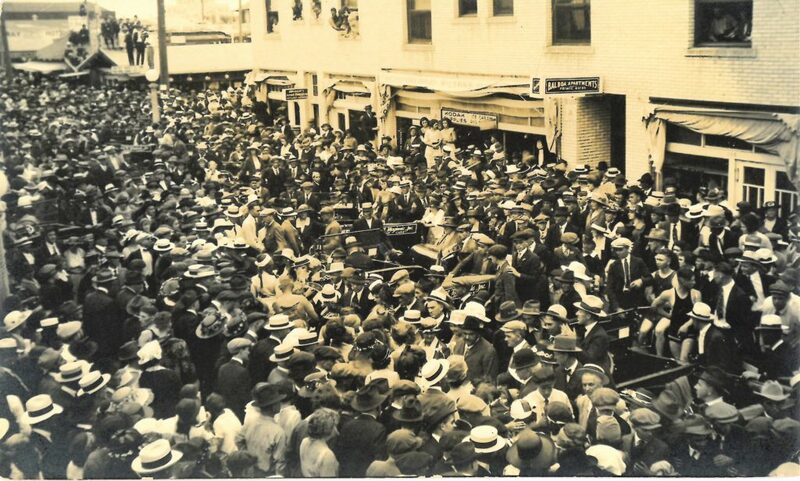 The photo shows people packed into the intersection of Main St. and E. Bay St. just in front of the Balboa Pavilion. Perhaps this is the parade of “Beach Beauties”…..not too certain. Besides the massive crowd, if you look closely you can see several things including signs displaying Kodak Supplies, Ice Cream and the Balboa Apartments. I can’t make out what it says on the back of the vehicles and any help deciphering it would be appreciated.